Felisa Longas, 1 Urb. Gato MontÉs (Playa Almarda), 46500 Sagunto, Spanje. Hotel Els Arenals is located on the first natural line beach, on the well-known Almardá Beach, in Sagunto, at just 35 km from Valencia. 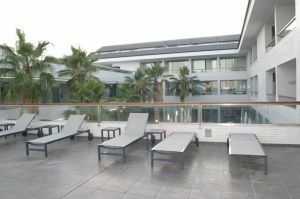 The els arenals hotel has a privileged location and impressive views toward the sea. And the hotel offers 76 rooms, from which double rooms, 7 Junior Suite and one spectacular Suite with panoramic window offering views over the Mediterranean Sea. 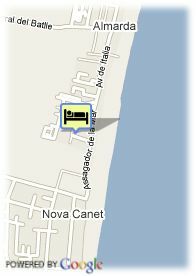 All the rooms dispose of terrace and all the usual elements characterizing a superior 4-star, the most of the rooms with views to the sea. The hotel also offers a restaurant with terrace in summer, palapa bar (tropical seasonable bar), outdoor pool, paddle court, a 400 m2 spa (at the end of 2009), gym (end of 2009), lobby bar, 2 lounges to hold reunions, special events, banquets. With a decoration in the colonial style, the light of the beaches from the Valencia coast, its typical gastronomy and the relaxation and the rest within our spa meet together in our hotel. That is why the els arenal hotel is an ideal place for the couples' holidays, weekends and short company incentives. Gratis overdekte parking aan het hotel.